Organised by UBM Connect and Seatrade, the world’s largest cruise industry fair, Cruise Shipping Miami concluded last month in USA. Two new studies on Asia’s cruise market released by the Hong Kong Tourism Board (HKTB) reveal a potential 83 million cruise passengers in Greater China and highlight how Hong Kong and regional ports are gearing up to tap into this market by upgrading cruise infrastructure and tourism offerings. The studies – the Asia Cruise Potential and Passenger Behaviour Study and the Asia Cruise Port Development Study – were released by HKTB at the recently concluded Cruise Shipping Miami. The study reveals a potential 83 million cruise passengers in just seven source markets within Greater China. This figure is four times the current number of cruise passengers worldwide. 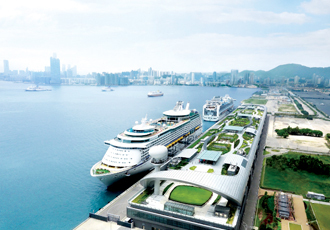 Hong Kong, with its connectivity to the Pearl River Delta, Central China and Taiwan by air, high-speed rail and land transportation via the Hong Kong-Zhuhai-Macao Bridge, is looking at a cruise potential of 54 million passengers. The study also reveals that the make-up of these passengers is younger and more family-oriented than cruise passengers in traditional source markets such as North America and Europe, where they tend to be older, retired achievers. As many as 69 per cent of respondents from the family segment with children under the age of 16 said they intended to take a cruise, while more than 51 per cent of respondents between the ages of 20 and 29 said they have set their sights on a future cruise holiday. The second study, Asia’s Cruise Port Development Study, focused on the development of ports in Hong Kong and neighbouring areas. The study identifies 21 ports within six to seven cruise days, which already have concrete plans to upgrade berths, cruise infrastructure and supporting infrastructure, as well as expand tourism offerings and improve destination management in areas such as the issuing of visas. According to the study, within five years, half of these ports will be able to receive cruise ships of 100,000 gross tonnage.